Yoga Immersion Adventures for lovers of yoga, travel, nature, culture and service. Continuing Education Yoga Alliance registered. 50 hr. (40 contact, 10 personal). Option: hours toward 300 hr certification. Teaching Yoga to the Village People, Seva/giving back, technique, methodology, Bhakti, Balinese Ceremony and Ritual, exploring the Maha Bhuta/the great elements and the roots of Yoga Philosophy, Applied Anatomy and Physiology physical and subtle, Meditation for Life, Pranayama made simple. Yoga meets Neuroscience. Join us on this amazing cultural and spiritual journey deep into the heart of this magical island of the Gods. Share in our 30 years of living, learning, praying and playing in a small Balinese Village and our connections with the people, culture and spirit. This Bali Yoga Adventure is designed to bring the experience of Bhakti to life, to deepen your Yogic wisdom, to create a deep connection with the Balinese people and its culture and to give you the opportunity to study Yoga and to share the benefits of Yoga with the Balinese people. The island of Bali embodies a spiritual and cultural existence like nowhere else on earth. Bali is a unique gem faceted by the hands of its people into a perfectly landscaped paradise. The Yogic soul is alive and tangible as culture blends with spirituality and Bali's earth based Hinduism blends with her Mother India. We will journey into the heart of the Balinese world-view that sees the three most important aspects of our being as our connection with nature, with each other, and with spirit. With this world-view as our foundation for our time together, we invite students, teachers and adventurers to deepen their practice. The deep reverence with which the Balinese live in harmony with nature, with each other, and with Spirit is reflective of their deep yogic roots and the honoring of all life. This beautiful, earth-based culture is rapidly changing. Now is the time for us to learn from them and to give back! Students with a 200-hour certification will receive 50 hours (40 contact and 10 non-contact hours) that can be applied toward continuing education. If you are seeking a 200-hour certification, please contact Deborah for information regarding integrating this Yoga Adventure into your certification program. You can participate in this Yoga Adventure if you have not completed a 200-hour certification and would like to deepen your own knowledge of Yoga. Regardless of where you are in your Yogic journey, we invite anyone who feels drawn towards this experience to join us and become a part of our global family! During our stay we will live in the small Balinese village of Nyuh Kuning adjacent to a sacred monkey forest and temple in a where Deborah has fostered friendships for over 30 years. Our days will revolve around yoga and village life. We will experience the softness of Bali; forests, picturesquely sculpted rice terraces, looming volcanoes, deep lush river gorges, warm soothing seas and sand beaches. Visit "Balians" (Balinese Healers) and local artisans. Attend temple ceremony, celebrations, and ritual. Experience an array of exotic Balinese dance performances and music. Enjoy Balinese massage and spa treatments and an adventurous day of cycling through small villages. Each day we will hold morning and afternoon yoga sessions, be active participants in the village and teach “Yoga to the Village People”. There is free time to explore, study, relax, and receive massage. “Yoga for the Village People” is a grassroots program in this village. Deborah’s Balinese brother Made Wena is a true inspiration as he continues to serve as a stronghold for the village supporting the elders with yoga and movement classes. Deborah is passionate about this project and has raised funds and secured the land and is currently in the process of raising funds to build a non-profit community Yoga studio that the Elders can practice in year round. 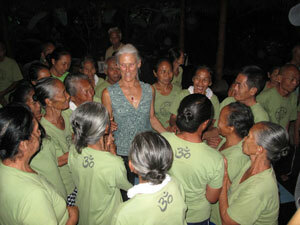 Our group will lead Yoga classes to over 100 Balinese Elders who live in the village and teach private, therapeutic Yoga to individual Elders with specific needs. This one-of-a-kind program allows us to give back to the Balinese people, helping them to expand their knowledge of personal health and well being through Yoga. 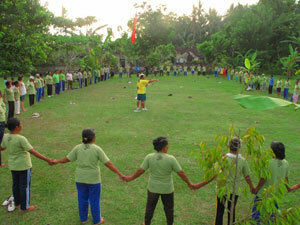 It is an incredible opportunity to make a difference in the lives of the entire Balinese community. You are guaranteed to leave this experience changed forever! The appreciation runs deep! 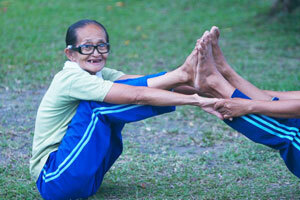 For more details about “Yoga for the Village People” go here. Airport transfers and all transportation for group activities is also included in the trip price. Accommodations are based on double occupancy and will be arranged for you. The small, artisan village of Nyuh Kunning where we will stay is adjacent to Ubud and the Sacred Monkey Forest. There will also be a special additional beach and rice field adventure component to the training. Please contact Deborah at Deborah@yogaadventure.com with questions/interest in this amazing adventure. This is an enriching journey of a lifetime and we hope you can join us! The course syllabus meets requirements for hours applied to continuing education and 300 hr certification in the areas of teaching technique and methodology, anatomy and physiology, Yoga philosophy, ethics and living the life of a yogi, practicum and electives. Certificate of hours aquired for yoga therapy training also available from Deborah. Creative sequencing of yoga for cultural, age and physiological differences. Being present with what is and using our skills to create safe and beneficial healing practices.